This is a bit different but comes out just as good! Add cake mix and powdered sugar to a microwaveable bowl. Mix together. Add in butter and milk. Do not mix. Microwave for 2 minutes on high. Remove from microwave immediately and stir together to combine. 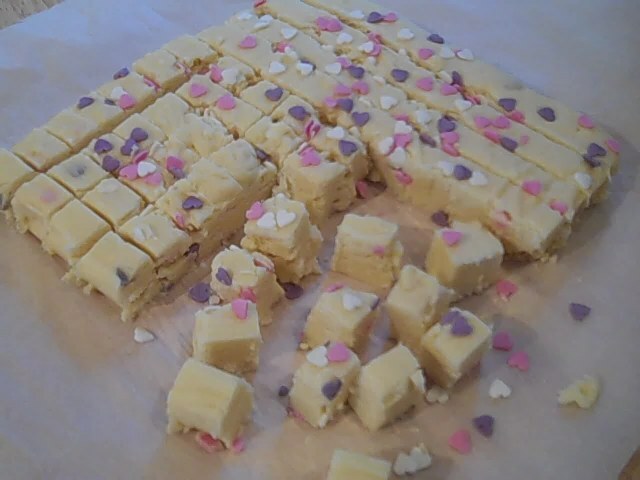 Stir in half of the Valentine’s sprinkles. Immediately spread the batter in an 8”x 8” greased baking pan. Add a few sprinkles to the top and press down with a spoon. Refrigerate for 2 hours or until set. Cut into squares and enjoy!